A classic BMX frame gets a 21st century update. Schwinn has been making bicycles since 1895, with everything from cruisers to mountain bikes forming part of its history. When one of its legendary designs comes back to market, it’s enough to make us sit up and take notice, and the Schwinn Predator is nothing if not legendary. 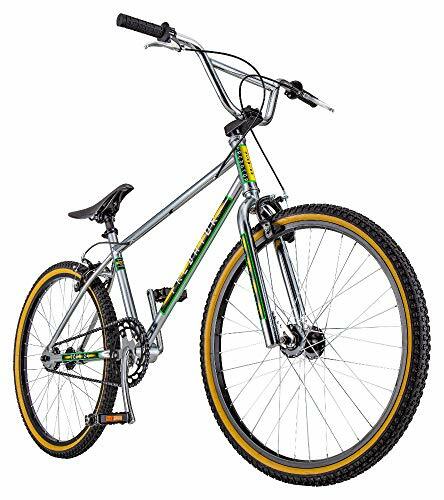 The original bike, first released in 1983, was one of the company’s early efforts at cracking the BMX market. The revived edition brings back the iconic style and high-quality construction of its progenitor in a bike that wouldn’t look out of place in Hawkins, Indiana. The new Predator has the classic lower-to-the-ground profile of a BMX bike that’s great for tearing around the neighborhood on asphalt or dirt. There aren’t any gears or pedal clips to worry about; it’s designed to make it easy to jump on for a quick ride to a neighbor’s house or a friendly race around the block. A faithful rerelease of the classic 1983 design. Its neon green, yellow, and black paint job isn’t as tacky as it sounds, and it is true to the style of the time. The frame itself is made of high-tensile steel, with aluminum alloy rims that hold bum wall tires, a nice touch that’s more visually interesting than plain black tires. The hand levers that control front and rear brakes are the only adornments on the of the bike, so it retains a level of simplicity in operation and appearance that mountain and hybrid bikes just don’t have. The Predator comes unassembled, so be ready to spend a few hours reading the instructions and putting it together. Once you’re done, your kid will have a great, basic bike with a great legacy that they can use throughout their childhood.